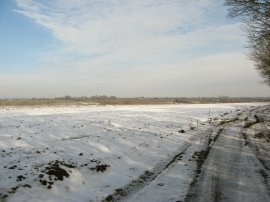 I did this walk on the 8th February 2009. 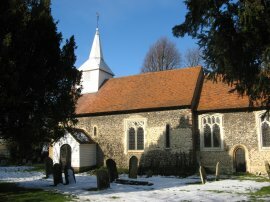 I drove over to Ongar and parked in the car park besides the library before walking the short distance down the High Street to resume my walk along the Essex Way at St Martins Mews. 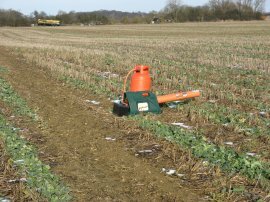 There had been a light frost overnight and there was still plenty of snow on the ground from the previous week. The weather was grey and dull for much of the day although it did brighten up for an hour or so in the early afternoon. I headed up St Martins Mews, passing the church, before taking a short footpath at the end of the mews that leads up to a small lane. Here I turned to my left and soon joined a broad grass covered track, photo 1, that runs between fields. 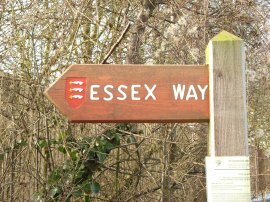 At this point the Essex Way also links up with the start of the St Peters Way which makes its way from Ongar down to the coast nr Bradwell. 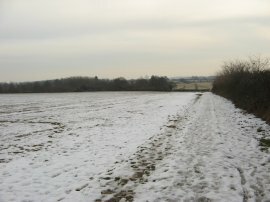 After skirting the edge of playing field the route turns to the right and start heading gently downhill towards High Ongar, photo 2. At the bottom of the field the route turns to the left and heads past some trees down to cross over the A414 Chelmsford Road. 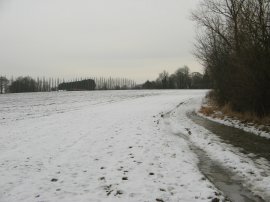 The route then crosses over a scrubby patch of ground before crossing over the old Chelmsford Road and joins footpath that runs over a field towards the banks of the River Roding, photo 3, which the Essex Way then follows for about a mile and a half along the bottom of a very shallow valley with fields on either side. 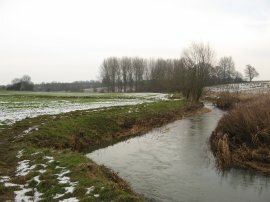 Eventually the route crosses over the river on a metal footbridge and head to the right to join a hedge lined byway that runs up to some houses and a road at Cannon's Green. The byway was quite flooded and there was a steady stream of water flowing down most of its length which made it very hard for me to keep my boots dry. The route heads up the road for a short distance before taking another wet and muddy byway that bears off to the right although I ended up walking along the field edge, photo 4, besides the byway as I headed down to join the Willingale Road. The Essex Way turns to the right along the road before taking a footpath on the right that crosses over a small grassy area in front of a fine old house before passing through a gate and heading across a couple of wide open fields of the sort that I often associate with walking in Essex as the route begins making its way towards Willingale, photo 5. This point also marked the limit of the stretch of the Essex Way I had already walked. Reaching the Fyfield road the route turns to the left then follows the road round to the right. Where the Fyfield road bends to the left the route continues ahead before taking a footpath on the right that leads into fields. 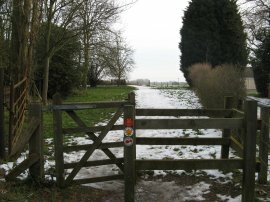 This right turn is a little earlier than how the route of the walk is shown on my rather old Explorer Map however stile was marked with one of the poppy waymarkers. In fact once again the route throughout the day was generally well marked and there were only a very few occasions when I had to stop and look at my map. There were a couple in the field ahead of me who, when they saw me, stopped and waited for me to catch up. They were out walking a dog which was lost and that they had looked after the previous night. They were now taking it for a morning walk and wondered if I had encountered anyone looking for a lost dog while I had been out. They had rung the dog warden and RSPCA but they were all shut for the weekend. The dog, a large male bull mastiff, looked well cared for and had a collar but no identification tag, although hopefully it had been chipped. It was an extremely sociable and well behaved dog and we walked together over the fields to the edge of Willingale. I really do hope he was just lost rather than abandoned and it was very tempting, although completely impractical, to take him home. 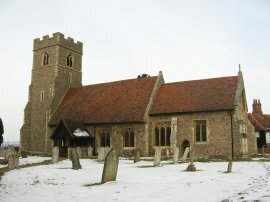 Having said good bye to the couple I left the fields and entered into the churchyard in Willingale which was very strange in that it contained two churches, St Christophers to the left, photo 6, and St Andrews to the right, photo 7. The sky is much brighter in photo 7 as I took the photo in the early afternoon on my way back to the car. From the churchyard the route heads across the road and continues along the edge of a playing field before heading back out along a footpath running alongside the edge of fields. 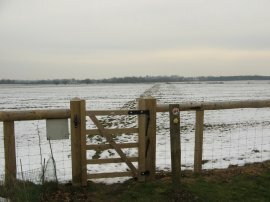 At the end of the second field on the left the route turns to the left and heads down the side of a large field, turning right along the field edge at the end before taking a footpath off to the left that runs down to cross a minor road, Skreens Park Road. Once over the road the Essex Way continues ahead along a rather muddy, hedge lined byway although fortunately the surface was still relatively frozen which made walking along it far easier than it otherwise would have been, photo 8. 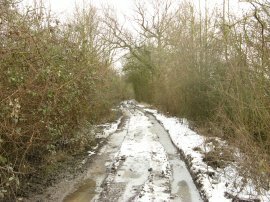 This byway, which was often quite gloomy, was followed for two miles as it made its way through the farmland down to the small hamlet of Pepper Green. Here the route joins a surfaced track that leads up to the A1060, the junction with the main road being marked by an impressive wooden sign, photo 9. Crossing the road the route joins a farm track that runs down the edge of a field which was where I decided to finish this stage of my walk along the Essex Way, photo 10. Ahead of me I could see the village of Good Easter a mile or so in the distance however I had already walked 8.38 miles from Ongar which was long enough considering I also had to walk back. Heading back to the car at Ongar I was able avoid most of the paths I had used on the way out, turning the walk into a figure of eight with the two routes linking up for a short distance at Willingale. Scenery wise much of the walk very similar to that on my outward journey although once the sun came out the snow started to melt quite rapidly and was quite soft to walk in and some of the fields became very muddy to walk across. This was quite tiring on my legs, which began to hurt a little, and my pace slowed down considerably. Most of the paths I took on the way back were quite well signposted and I only missed one path I intended to take. However this led me to find one of the more unusual sights I spotted during the walk. Reaching the village of Shellow Bellows I spotted a building that looked very like a church, although none was marked on my map. As I got nearer I could see that the building, which was once the village church dedicated to St Peter and St Paul, was now clearly a private house however it was surrounded by a completely intact graveyard, headstones and all, almost right up to the front door. I have passed converted churches before but never one with an intact graveyard in the garden. One feature of this walk was the almost incessant popping of bird scarers and crossing a field close to Willingale I passed one right besides the footpath, photo 12, which I was dreading going off as I went past although luckily it went of twice in quick succession when I was still a decent distance away from it. Arriving back at the car in Ongar I had walked exactly 17.0 miles, according to my new GPS, or 16.9 miles according to the old which was considerably more accurate than normal for it, probably because the wide open fields and lack of tree cover meant it was able to keep a better signal than usual. 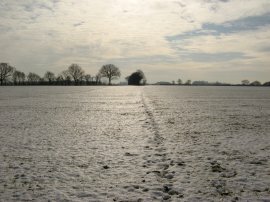 It had been enjoyable to be out walking in the snow again, particularly in the morning when the ground was still frozen. I am also now in an area where I have not done any walking before and it is always nice to explore a new area for the first time, (which is one of the reasons why I am quite happy doing the Essex Way as a series of circular walk). My next stage will probably be to Great Waltham.